It is not available for sale in printed form. Chapter 2 - What is the Family of God? Chapter 9 - What About Hellfire? We UPDATED this page to make all the chapters accessible to you immediately. 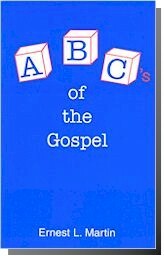 We believe that the book ABC's of the Gospel is so vitally important that you need ALL the information available as soon as possible.